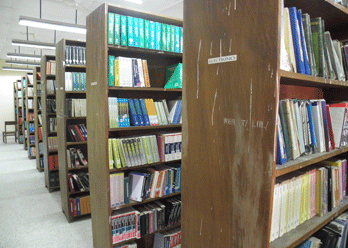 The institute has a library system which consists of a Central library and 11 departmental libraries supporting the teaching, research and extension programme throughout the academic year. The students, faculties, employees are issued library card for issuing books from the central library. The library is having a mammoth collection of books on every engineering subject. Besides that, the library is having a journal section from where one can issue the latest version of most popular and useful journals. The library is also having a very good collection of novels. Book bank: In addition to the library system, the institute is having a book bank facility for the students from where every student get a set of useful text books related to the academic syllabus of that particular semester. The books bank was funded by North East Council (NEC) initially; later NERIST provided the useful funds for upgrading and enhancing the collection of books. Journals as on 31.3.11 : 136 nos. ACM Digital Library | ASCE Journals online | ASME Journals online | IEL Online | Nature | Pro Quest Science | Springer Verlag's Link | URL to DBT-DeLCON website | LIST OF DBT-DeLCON JOURNALS. "All e-journals can be accessed/ open directly from the title on the word file by pressing control key of keyboard and right click (of mouse) as well as from the pdf file by one right click on the journal title".